Modern dentistry can restore your tooth even if there is almost nothing left of it. There is no need to remove the tooth, you can just put the crown. A crown is a design that is put on the rest of the tooth and executes its functions. Nowadays, modern crowns are indistinguishable from natural teeth.A dental crown recovers a tooth’s form, strength, and size. It encases the visual part of your tooth or dental implant. The longevity of the crown is also important. The life of a crown can last 10-15 years and even more. The difference between dental crowns is the material. As a rule, the strength and appearance of the crown depend on the material. Dentist Glendale, Dr. Sahakyan is a well know expert in dental implant restorations. If you need an expert advice please contact us or call us. To restore your beautiful smile by covering a deformed, discolored tooth. At the present time, there is a wide selection of dental crowns. Your dentist will recommend the most suitable version for you, depending on the chewing placement and structure of the tooth that demands restoration. Which Crowns do We Use? 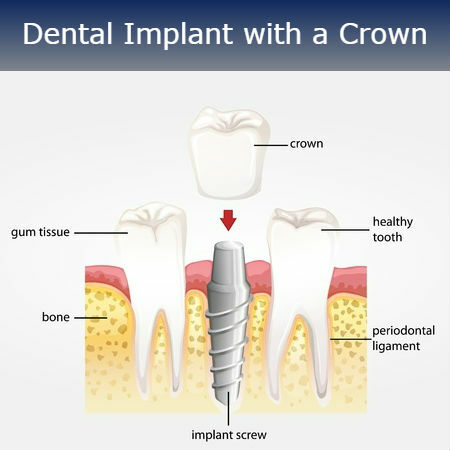 Different types of dental implant crown types recommended by dentist Gledanale, Dr. Sahakyan: Ceramic, Zirconisum, Yellow Gold. Choose the correct materials. Porcelain dentures are attractive, strong, functional, and highly resistant to wear. Porcelain crowns are made of pressed ceramics that do not contain metal. 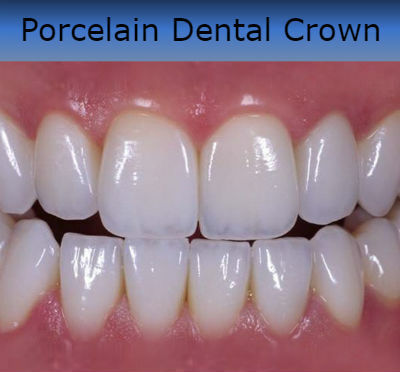 In modern dentistry, a porcelain crown is used for aesthetic restorations, when the installed prosthesis does not differ in appearance from the natural tooth. This crowns are used mainly on the front dentition and will be a good choice in many situations. Ceramic crowns E-MAX – is a non-metal pressed ceramic. The crowns are affixed with a special cement, which connects the tooth tissues and the surface of the prosthesis.This type of prosthesis is used in the case if it is impossible to put metal-ceramic crowns – for example, during the prosthetics of the smile zone. It is used only to replace single teeth. Schedule an appointment on ZocDoc with the best dentist in Glendale. These ceramic crows possess maximum aesthetics. Presser ceramics is close in structure and visual characteristics to tooth enamel. Due to the lack of metal, it is biocompatible and hypoallergenic. They also have a long service life. GOLD dental structures are used in prosthetics of biting and chewing teeth as they are able to survive a lot of chewing. A metal crown is strong and rarely breaks. It demands the least removal of tooth structure. GOLD crowns are recommended for back teeth. The GOLD crown is an excellent choice if you don’t mind the fact that it’s not tooth-colored. About 20 years ago, gold crowns installation was the most desired way to restore teeth, as is one of the safest material for the body. It is stronger than an all-metal one, due to their 100% metal construction. 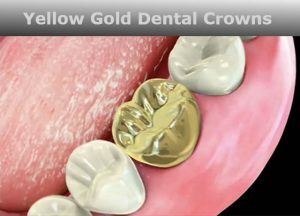 The main disadvantage of gold crowns is the appearance. They are not like natural teeth. However, their service life is practically unlimited. In addition to durability, they are compatible with the human body. Dentist Glendale, Dr. Sahakyan loves to see how patients enjoy their new dental crowns. Give us a call at 1-818-578-2324, make a ZocDoc appointment. 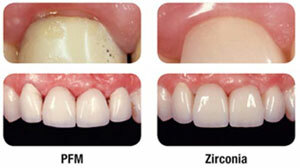 Having a high bio-compatibility, zirconium does not cause an allergic reaction or gum disease. It is important to get an artificial tooth that will be completely safe for the organism and will look like as natural. Teeth with zirconium crowns are not sensitive to cold or hot. These crowns have a lower thermal conductivity.Ceramics based on zirconium is a hygienic material that does not change the taste feeling. does not cause any problems with the gums. Ceramics on zirconium basis are used for replacement of teeth in both the front and rear rows. High-quality crowns last more than 20 years. Transparent ceramics on a zirconium basis makes it possible to choose a color that exactly matches the natural color of the teeth. Among all brands of zirconium crowns, the most reliable are zirconium crowns “LAVA” which allows you to install crowns that have a more esthetic appearance. Choice of the optimal method of prosthetics is based on the clinical situation, the position of the prosthetic teeth and the financial capabilities of the patient. Smile Makeover of LA offers dental services in Glendale, Burbank and surrounding areas. If you would like to make an appointment to see the best dentist in Glendale Dr. Sahakyan, contact us or give us a call at 818-578-2324.